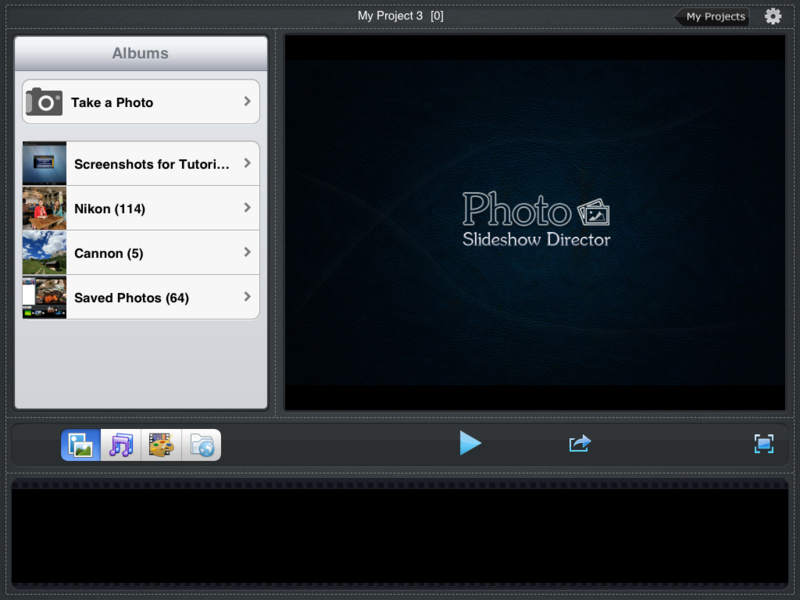 How to creat slideshows for your flickr web album on ipad with Photo Slideshow Director HD? 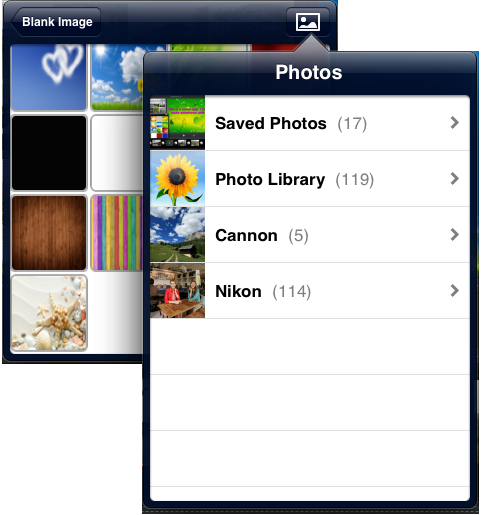 ← How to turn your picasa web album into slideshows on iPad? 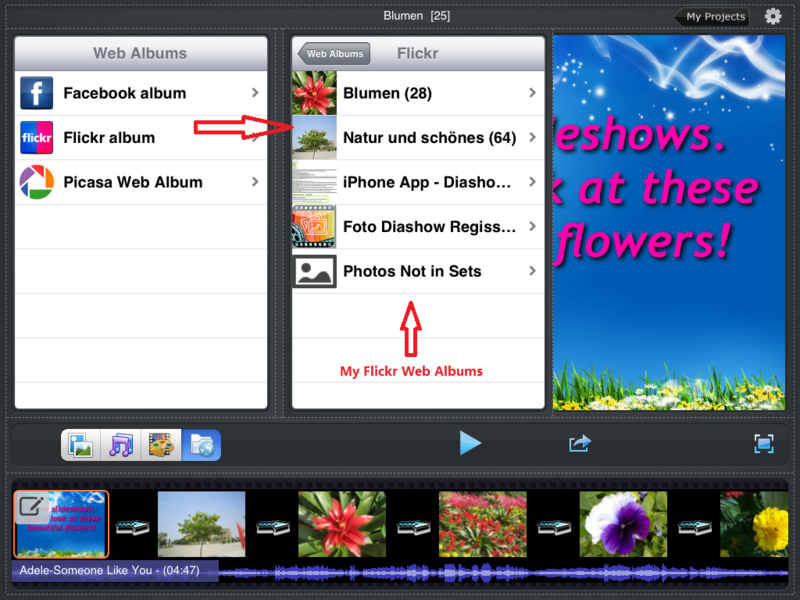 How to create slideshows for your flickr web albums on ipad? You have uploaded a lot of photos to your flickr web albums, like me and most other cool guys. You can share them within your networks there flawlessly, that´s for sure. No problem. Yet sometimes, when you need to show these photos on a family reunion or friends get-together, it would be very inconvenient to sign in to flickr, find these photos and show to them. Further more, the screen of the computer or the ipad would be too small for everybody to see the photos clearly. 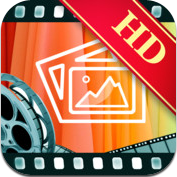 In this case, you can use one ipad app named Photo Slideshow Director HD to help you. 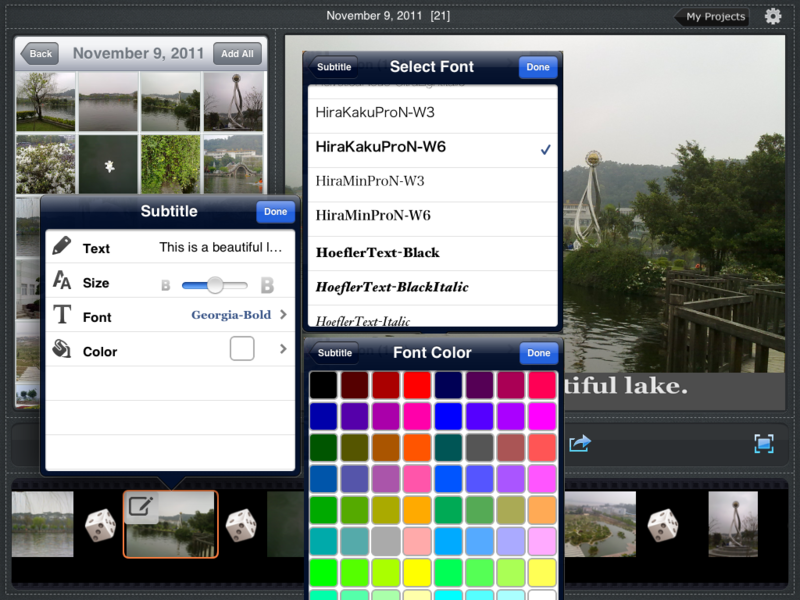 With this cute little app you can turn your flickr web albums into eye-catching slideshows on your ipad in minutes. Then play the slideshows on big screen HDTV and everybody will be happy to enjoy the slideshows. After the app was correctly installed, launch it. Goto “My Projects”, tap on “new” to start a new slideshow. There will be a download process, during which the chosen photos are downloaded directly from flickr web album and added into the slideshow. If there are a large number of photos to be downloaded, please wait for a little while. 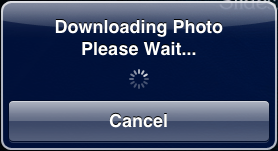 Note: If you want to avoid the waiting time, you can sync the image files through iTunes into iPad first, then add them directly to the new project. Subtitles: You can add a subtitle to each photo, like where or when it was taken, or on which occasion/event, with whom and so on. You can adjust the font, font size, and font color according to the content or the tone of the photo. There are a big bunch of choices for you. 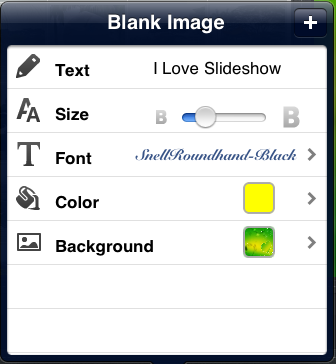 Blank Image: To demonstrate the photos and slideshow even better, you are able to add a blank image into the slideshow. On this page, you have chance to tell the viewers about the history or anecdote about the photo or the slideshow by adding a small text on it. Just like subtitles, you are also able to customize the font, font color and size. – Background for this blank image can also be customized. There are a few examples in the app which you can choose from. If still not happy with them, you can click on the button on the right to add your own background image. 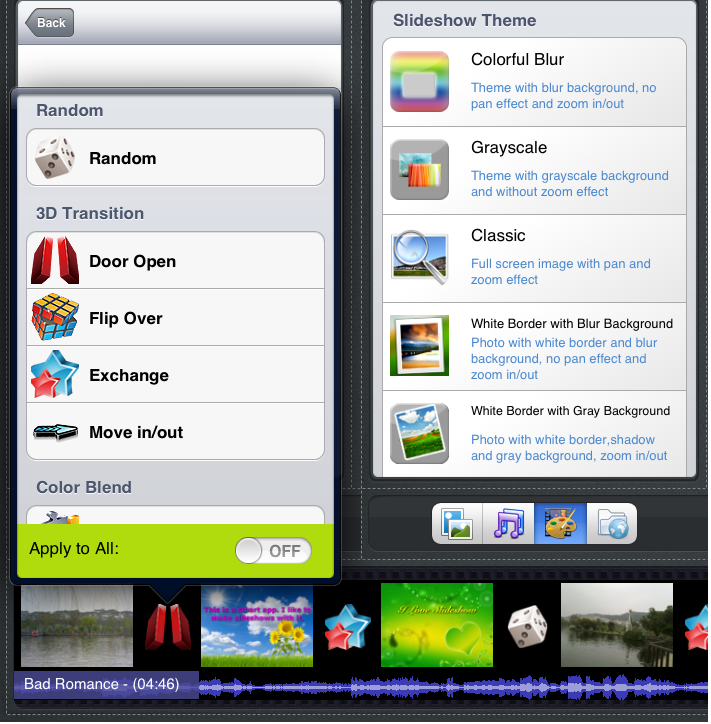 Transitions & Themes: There are more than 50 transtions and more than 10 themes for you to choose. These features will make the whole slideshow more interesting and thus more attractive. Note: Turn on the “Apply to all” button and you can set one transition for the whole slideshow. Music: No slideshow can go without music. Photo Slideshow Director HD is also no exception. You can choose background music from your iTunes library. After the music is added, there will be a stream line under the photos. And you can listen to them, displace them, or remove them from the slideshow. 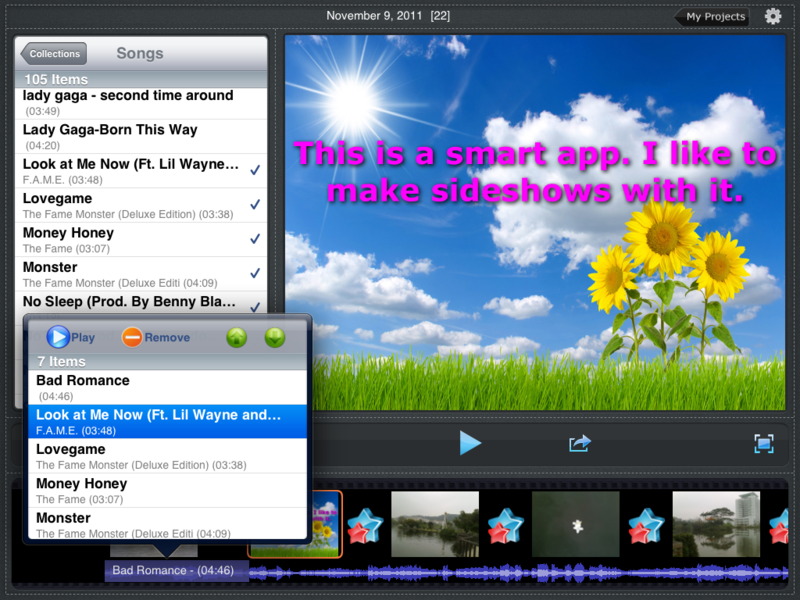 – Show time and transition time: There is a “Edit” button on the top right. Click on it and you can reset the time for each slide and transition. 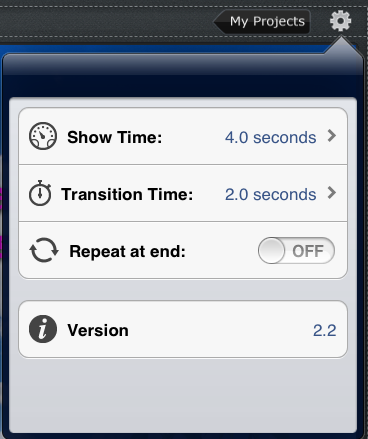 Default value for show time and transition time is 4 and 2 seconds. You can set the value between 1.0 – 10.9 seconds in line with your needs. Note: The version number can also be seen here. You can check if you need an update. By now, the creating process of the slideshow comes to the end. You can view it directly on iPad by ticking the “Play” button, or full screen play . Make some slight changes if necessary. And then you are ready to show your masterwork to the audience. All you need to do is to connect your ipad and the HDTV with Apple Digital AV Adaptor and HDMI cabel. Then your family members or friend and relatives can enjoy the slideshow together. 1. To rearrange the order of the slideshow, please use this button. You can put one slide forward, backward, to the first or to the last. It´s very convenient. 2. Please don´t forget to tick “Done” after you have input the subtitle and text. 3. Your projects will be save in the app. You can retrieve them later for further edition by clicking “My Projects”. This entry was posted in User Guide - Photo Slideshow Director HD and tagged flickr, flickr photo albums, flickr web album, photo album, photo editor ipad, photo slideshow, photo slideshow director, photo to video, picasa, picasa web album, Slideshow, slideshow ipad, web album. Bookmark the permalink.